The decoration is composed of three frames and of an inner section. 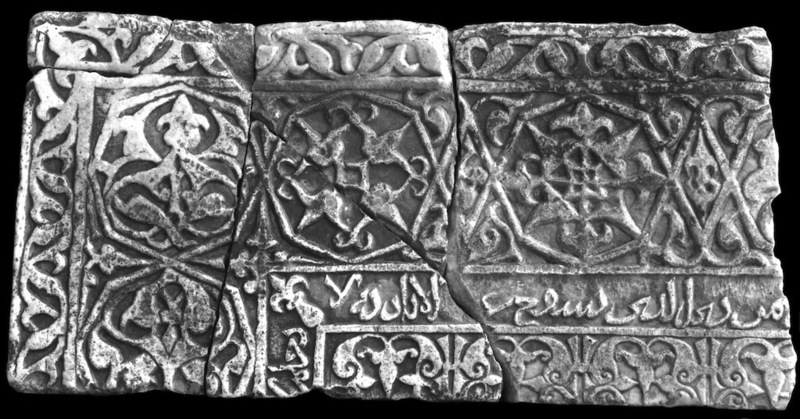 The exterior frame consists of a sequence of two interlaced and rolled up scrolls (fleur-de-lis set in the corners), the middle frame of an octagons modular pattern, the inner frame of a narrow epigraphic band in cursive script (fleur-de-lis set in the corners), and the inner section consists of a kufic epigraphic band. The octagons modular pattern is composed of a sequence of octagons alternated to lozenges and generating cross-shaped elements; different vegetal or geometrical motifs fill octagons, lozenges and cross-shaped elements. The artifacts were found re-employed in a ziyara of the Ghazni area in 1957.